﻿ Best Price on Beach Break Resort in Jaco + Reviews! Set on Jaco Beach, Beach Break Resort features rooms with balconies, 2 outdoor swimming pools and a restaurant. It offers 5 mi of private beach and attractive tropical gardens. 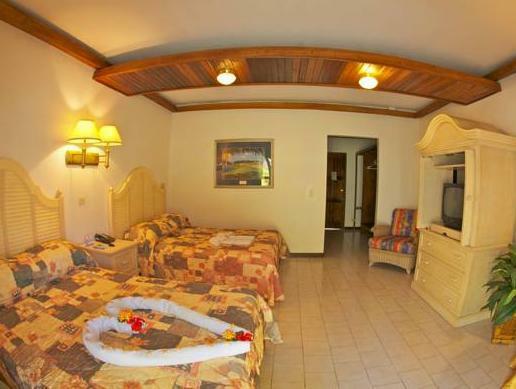 Each spacious, air-conditioned room, Caribbean-style decoration. There is a seating area with TV, a coffee maker and free WiFi. Guests can enjoy an American breakfast and international cuisine in the Waves Bar & Grill. There is also a bar and drinks are served by the pool. Beach Break Resort has a tennis court and parking lot, as well as a surf camp in the beach area. Dogs are allowed in Garden Rooms only, at an additional cost. Staff at Beach Break Resort’s reception can arrange trips to Manuel Antonio National Park and Vista Los Suenos Rainforest Canopy. Carara Nature Reserve is a 30-minute drive from the resort, while Playa Herradura Beach is 6.2 mi away. San José can be reached in less than 90 minutes by car. An extra cost applies of $15 for a dog per night. Please contact the property in advance. Guests are required to show a photo ID and credit card upon check-in. Please note that all Special Requests are subject to availability and additional charges may apply. Please inform Beach Break Resort of your expected arrival time in advance. You can use the Special Requests box when booking, or contact the property directly using the contact details in your confirmation. Everyting was great,can really recomend this hotel. Very nice poolareas,with sunbeds and 2 big pools. We even get surflessons for free, one per night. Our kids (7 and 9 y) loved to surf, and the surfteachers were so friendly and nice to our children. Breakfast was very nice,and included in our room. Room had nothing to complain about. The only negativ was that the beach wasnt the best, not the best sand. And we had beachfront, but no rooms are really beachfront, its a poolarea between rooms and beach.